On visiting a new client property for the first time senses are heightened; acutely aware that you will rely on every little detail and experience to bring the property to life in the many future conversations and presentations that you will undertake on its behalf. This was exactly how I felt on setting out to visit our new client, Santorini, in Mozambique. 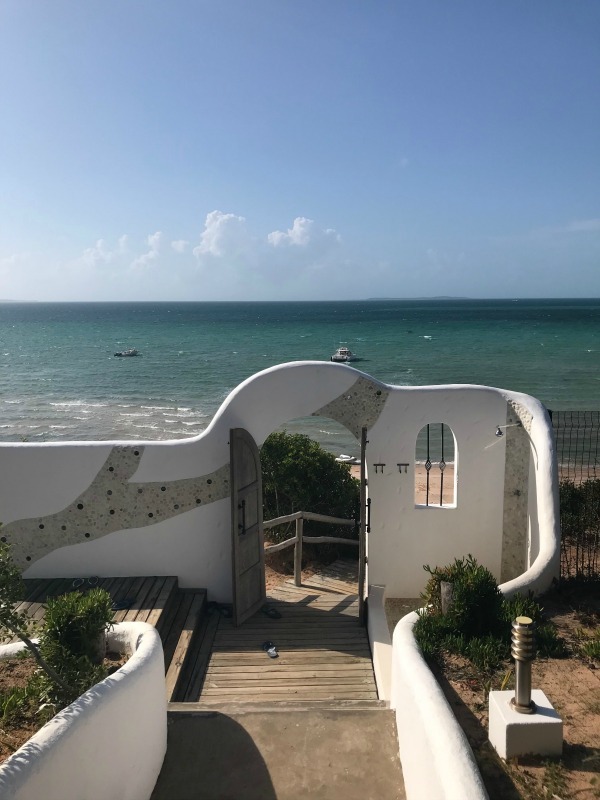 I consider the Mozambique coastline to be the best in the world, having been lucky enough to visit it often, and to get to know it very well, during the 7 years representing Azura Benguerra, and so I was delighted and excited to be returning. Whilst Vilanculos was unseasonably grey on arrival from Jo’burg, the smile that met me could not have been bigger or brighter, as Tatenda, the Santorini driver, greeted me holding a beautifully carved ‘Santorini’ sign. As we meandered our way through the sleepy mainland town, Tatenda enthused about all we passed bringing to life the 20-minute drive North up the coast. The tarmac road gave way to a sandy track for the last few minutes as we approached our destination. Santorini is positioned on top of the red sand cliffs of Kingfisher Bay and this elevated standpoint showcases a vast horizon with the most stunning endless view of the Bazaruto Archipelago. Walking through the arched doorway with its heavy carved doors, the sun was shimmering on the courtyard pool, which then gave way to a large, lofty lounge area of the villa with a backdrop of the incredible view. I drank all this in whilst sipping the offered deliciously refreshing Virgin Mojito. The team were keen to show me my room, so I prised myself away, reluctant to leave such a panorama. I needn’t have worried, as I quickly realised that every room in Santorini is designed to allow guests to enjoy this incredible view, with floor to ceiling windows. 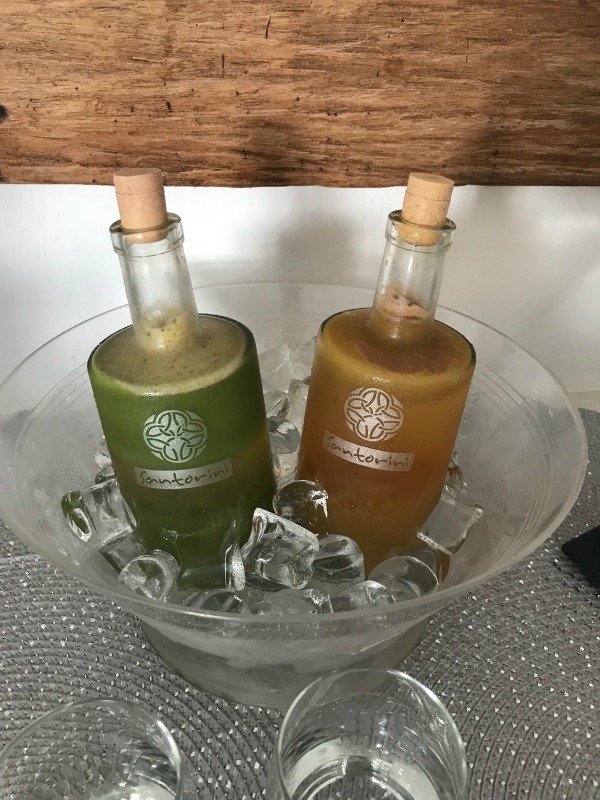 There are many times in this job that you wish your loved ones could be with you to share the experience, and walking into the Villa da Praia, where I was staying, was definitely one of these! I could just imagine my children jumping for joy at (and into!) the infinity edged plunge pool, my husband making himself comfortable on the deep sofa… and all of them raiding the pantry stuffed with help-yourself-treats. 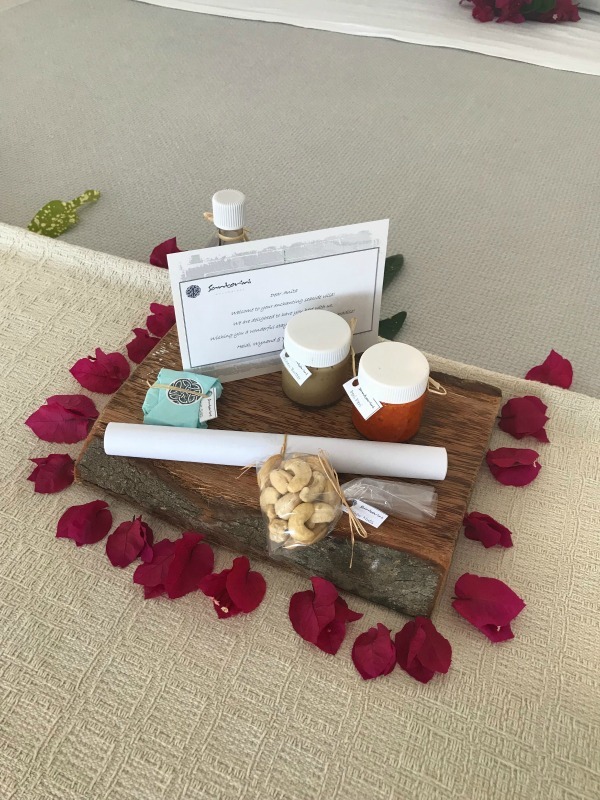 An inviting ‘taste of Mozambique’ tray welcomed me: gorgeous soaps, chilli paste, home made cashew nut butter- all made using organic and sustainable local ingredients. Villa da Praia offers three spacious bedrooms with en-suite bathrooms. I was staying in the master suite which has a beautifully designed and tiled outside shower and outdoor terrace overlooking the view. Santorini was built initially as a private house (with the open plan, multi-levelled main villa at the heart of the development) and it still feels more like a home than a hotel. 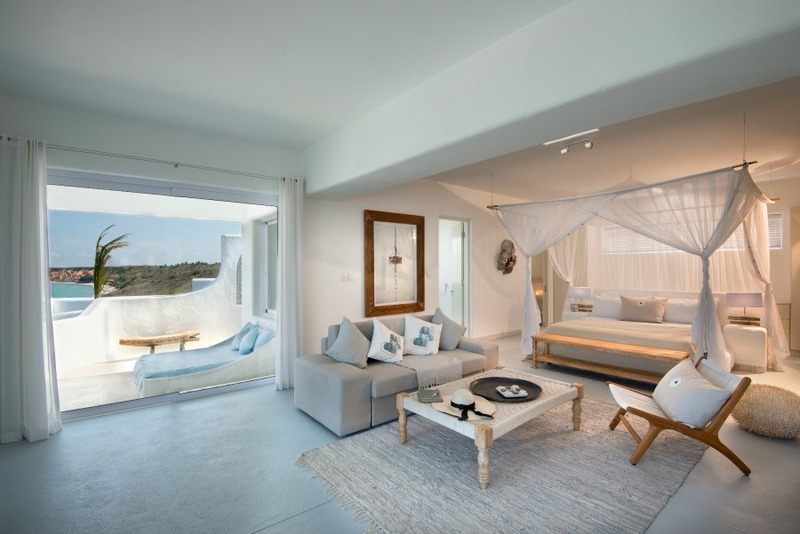 The architecture, and indeed the name itself, pays homage to a love of Greece, with its white-washed, thick walls and Cycladic structure, so at harmony with its clifftop setting. The tasteful, cool and calming interiors have been discerningly selected from Africa, Europe and Bali. The ‘home-from-home’ feel is conveyed in the large, deep, sofas, banquette seating and woven rugs; as indeed, it is through the wonderful staff, who encourage their guests to feel completely at home and relaxed. 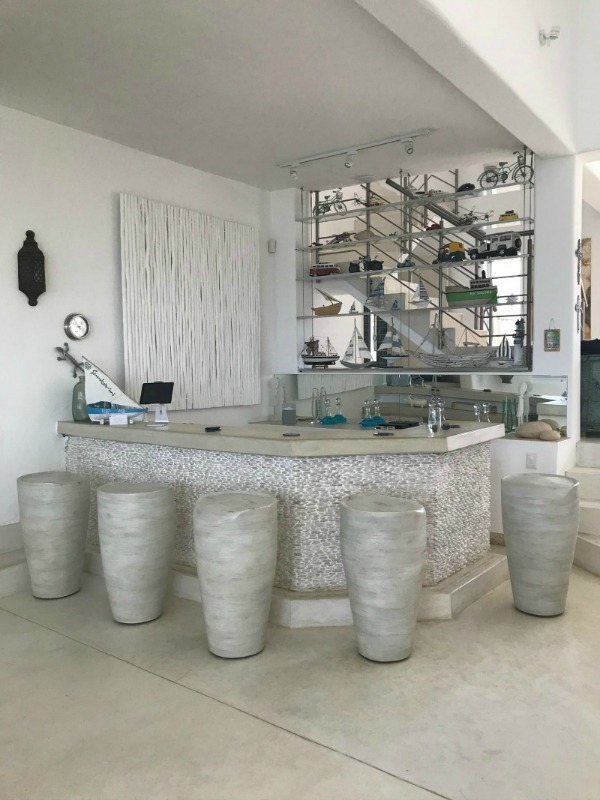 The architects have created private spaces dotted all over the villa including coolly designed bar areas, open lounges and a tv room. Guests can drink & dine al fresco in the roof top bar next to a lounge with shutters flung back to let the sun in (or shuttered down to stop the rain coming in as in my case). 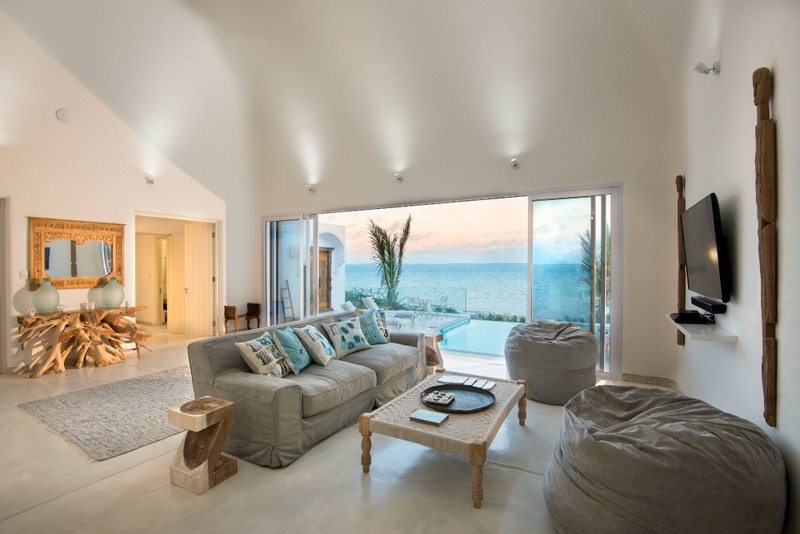 Each of these spaces is cleverly designed so that your eye is constantly drawn to the ever-changing view of the Bazaruto islands. The staff team is headed up by Brit, Heidi Rabbetts, and her South African partner, Wynard van de Watt who have been at the property for 2 years and came from working at Morukuru Family for 6 years. I was amused to find that Assistant GM, Lucy Bowes, came from 15 minutes down the road from me near Bath! Her partner Norman Walker is from Namibia and they joined the Santorini team nearly a year ago. They are a really impressive management team with a team of smiling supporting staff giving a very ‘family’ feel to the property. 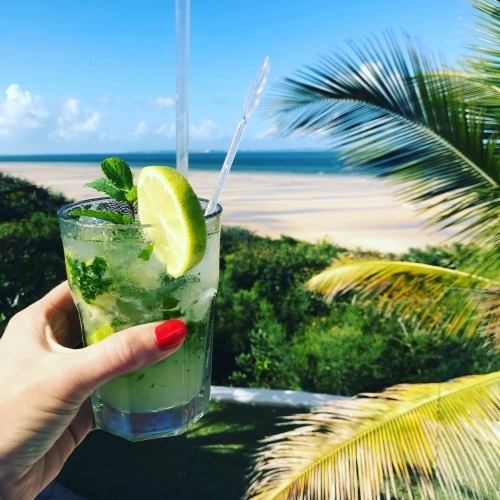 Back to my visit… I had arrived at Santorini Mozambique on the Royal Wedding day (the irony of sitting in rainy Mozambique whilst England was in summer glory was not lost on me) and the team were buzzing with having watched all the action on TV. It made me realise how incredible it is that the English pomp & circumstance can have an impact on even the most far-flung destinations! After a mouth-watering lunch of fresh salads and pizzas, hot from the wood fired oven, I ventured off on a boat cruise with the team. It was lovely to spend time with the people behind the property and to get more of an insight into why it was built it and what their aims are. The vision for Santorini was to create somewhere that would appeal to everyone: families, couples or individual travellers – all of whom could come here and fall in love with the area. As they regaled me with stories of the journey to create Santorini, of the area around Vilanculos and the characters that lived there, I couldn’t help feeling that the Bazaruto visitors who fly straight to the islands miss this ‘colour’ and insight into the local area. As dusk settled we moored up for a sundowner at the local bar ‘Casbah’ for a cool beer and a chat with the bar owner, whilst appreciating deliciously stewed octopus tapas. Tearing ourselves away from this characterful place we headed back to Santorini for showers and dinner. The daily changing 3-course feast is inspired by local produce and is overseen by GM Wynand’s keen chef’s eye and I enjoyed a delicious dinner of freshly made tortellini, melt-in-the-mouth langoustines and blueberry cheesecake. With biblical style rain pouring outside, I chatted further with the team about Santorini. 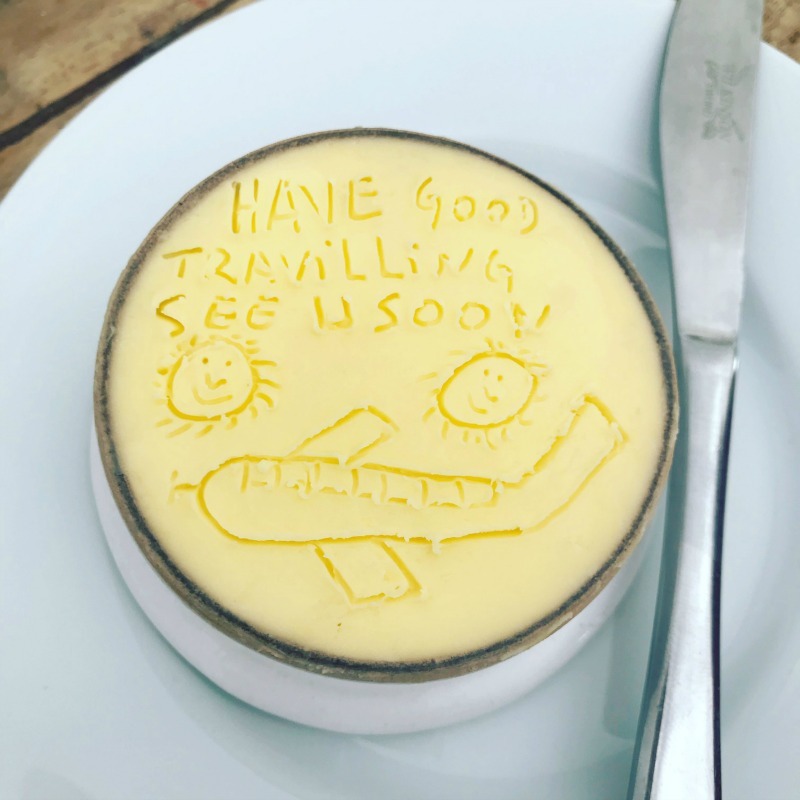 It is evident that Santorini is far more than just a business for them….it is a true venture of the heart, with their involvement in all details, even down to personally designing and carving the (very cool!) wooden bar stools. I woke up to a blue sky and the beckoning islands; and I watched the dhows zig zag slowly across Kingfisher Bay over a delicious breakfast of smoothies, home made yoghurt and homegrown fruit. The beach is a 30 second walk down the hotel path and my captains, Paulino and Laurenco, were there to greet me. Paulino has been working with the team for many years now and reading the sea is second nature to him. We set off in ‘Aphrodite’ and sailed out to the beautiful islands. Santorini has three different boats: a catamaran, and a small and large speed boat. They are also currently finishing off their traditional sailing dhow, which they will use for sunset cruises. All three boats are used for island hopping and dolphin spotting in the marine-rich waters. 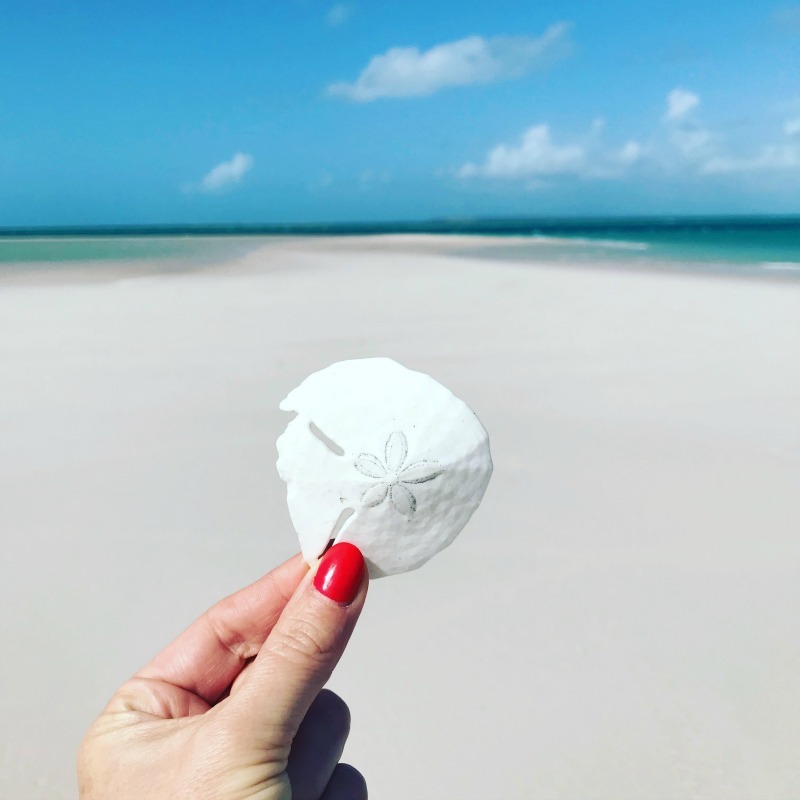 The Bazaruto Archipelago was once part of a peninsula connected to the mainland and at low tide lots of small sand spits and tiny islands appear. Pansy Island is one of the most beautiful and well-known of these soft white sandy spots, named after the sea-urcin skeletons with a distinctive pansy-shaped imprints. I spent a very happy hour wandering around admiring these beautiful shells. Next stop was snorkelling in Magaruque. The current was so warm and powerful you just had to lie in the water and the current would take you along the coral reef. Whilst the visibility wasn’t as clear as normal due to the rain and winds, I could quickly see how incredible this snorkelling experience would be. The winds were high, so instead of setting up a beach picnic for me, we decided to stay in the sheltered boat where I tucked into the delicious lunch of salad, tender beef, roasted vegetables, home made chilli sauce and fruit skewers. Dolphins and flamingos are frequent sightings on this trip, and whilst it was not to be that day, I did feel that I had had a real experience of what the islands have to offer. Back on the mainland I had been booked in for the Santorini Signature treatment, a full body treatment with hot stones and a mini facial…..Sometimes this job is just too tough! The spa was – quite literally - a haven of calm against the storm that was brewing all around! Heidi said that the spa courtyard is a favourite spot for private dinners and I can see why with its cascading waterfall and beautiful features. The spa itself is designed almost like a small villa with private gardens & en suite bathroom. The idea is that if they develop a separate wellness centre the current spa can be made into an additional one bedroom private villa. Nella, my therapist, was fantastic and after a hard week or working (& partying!) at We Are Africa I glided out of that spa!! That night I had a romantic dinner… for one! My table was beautifully set up on the roof terrace overlooking the pool when the heavens opened and I started getting poured on. My waiter very adeptly picked up the entire table and then adroitly replicated its beautiful layout downstairs inside the villa, even down to how the smallest flower had been placed. The level of service, care and attention to detail could not fail to impress the most fastidious and demanding of guests. The following morning Heidi gave me a full site inspection and talked through the future plans for Santorini. They have purchased the land next door and want to bring their guests closer to the nature surrounding the property so are planning to create tracks around it so that guests can go walking and cycling. A wellness centre perched on top of the highest cliff is also in the future plans. I was especially impressed with their gardens. 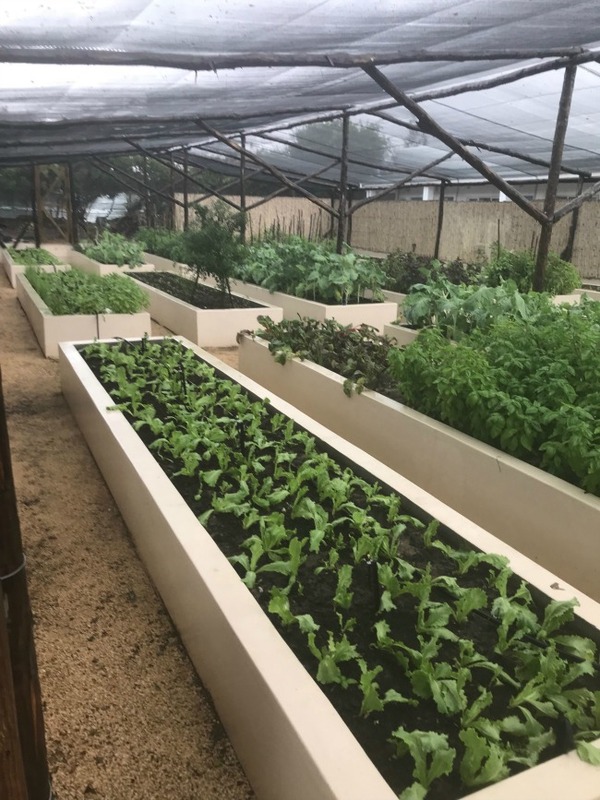 The many raised beds were overflowing with vegetables, salad crops and herbs. The boma with a fire pit was also a lovely area to gather around at the end of the day. Santorini has a really strong team of staff behind the scenes with the service being friendly and super-attentive and with a real commitment to meeting every guest’s individual needs. Family groups wanting plenty of activities? No problem; head down to the beach and make the most of the SUPs, kayaks & snorkelling equipment. Honeymooners wanting privacy and space? No problem; find one of the many secluded, private spots that are dotted around the property where you can while away the afternoon. 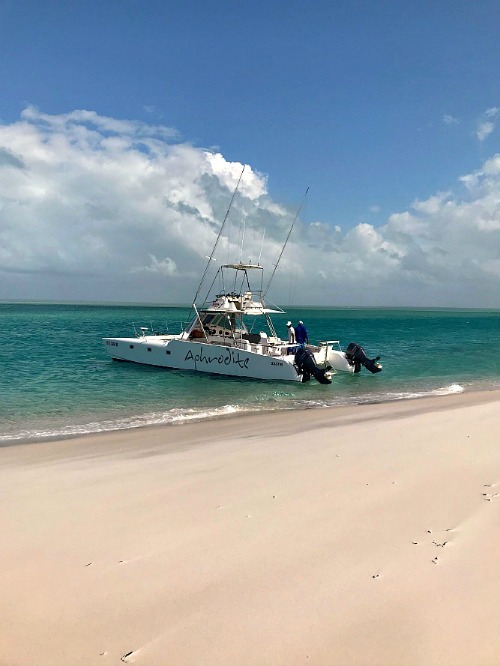 Having spent quite a bit of time on the islands of Bazaruto Archipelago, I was apprehensive about what the experience would be like when staying on the mainland. The beauty of Santorini is that you have the best of all worlds: with the island experience, the beach experience and the local culture experience co-habiting and complementing each other perfectly. Santorini was originally a home and looks and feels like a well-run private household, elegantly styled but never showy. 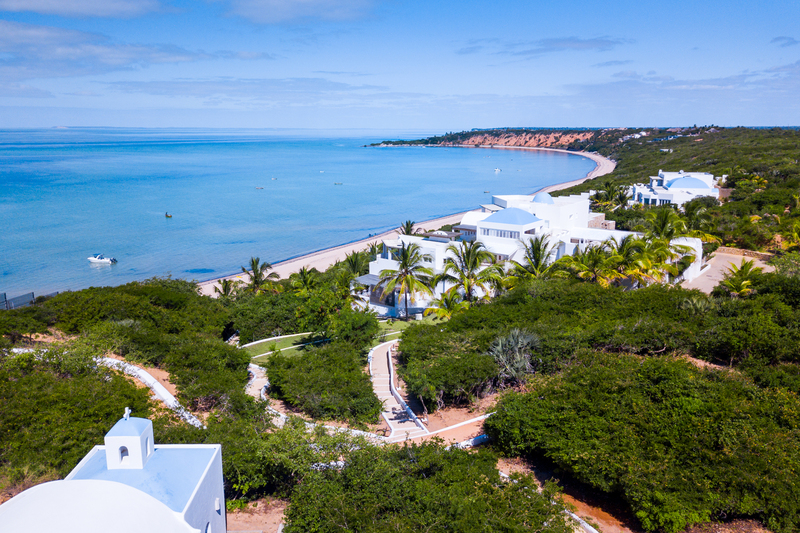 It is clear Santorini Mozambique is at ease with its Greece-meets-Mozambique vibe and has settled naturally into its location atop the cliffs. I came away knowing it will be an amazing property to represent with a delightful team to work with. 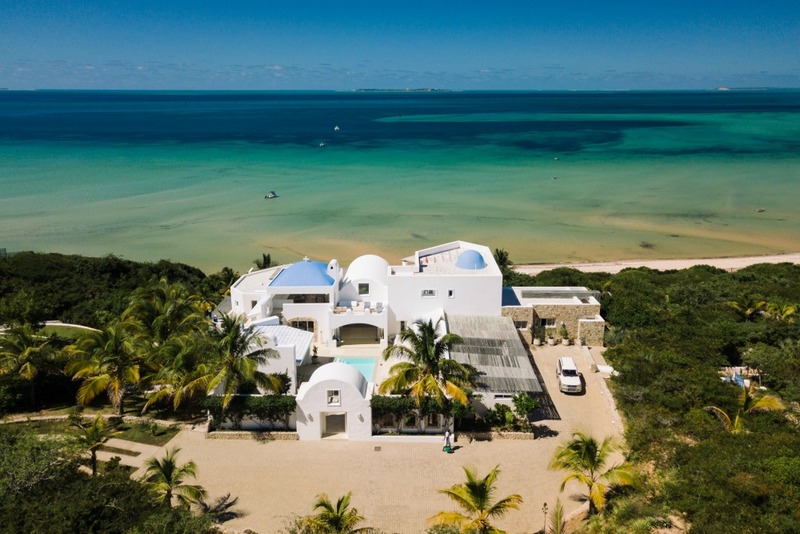 The property is divided into 3 main elements - The Main Villa which consists of 5 separate suites each named after one of the archipelago islands; The Chapel - a two bedroomed villa and the 3 bedroomed Villa da Praia. 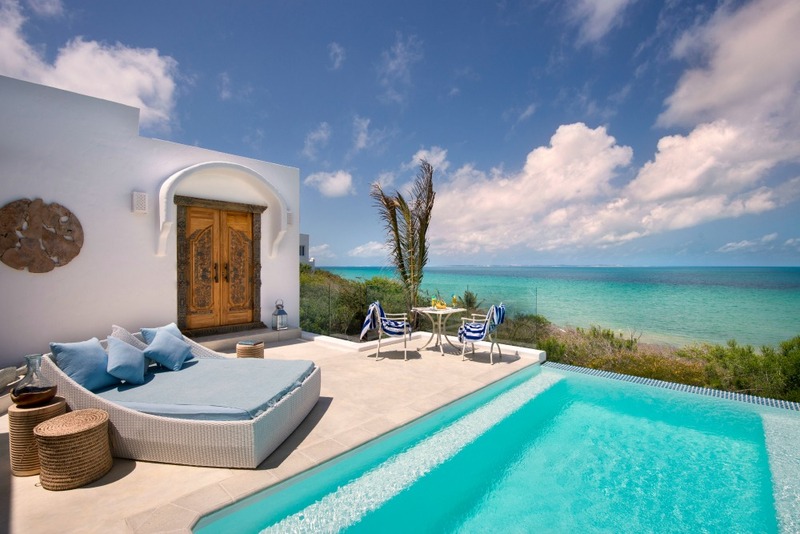 The three villas are cocooned by indigenous plants and are connected by winding sandy paths edged with low white walls through the gardens. 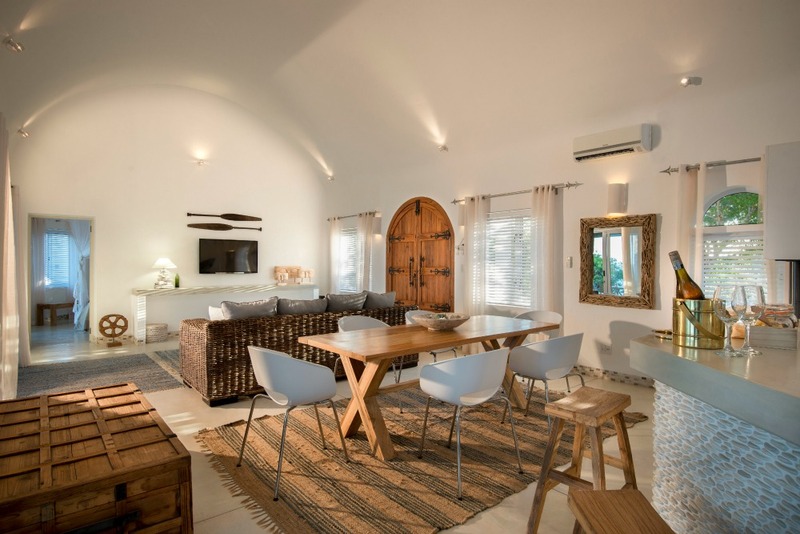 The main villa has only 5 bedrooms but communal spaces are big enough to hold a crowd with cool stone floors and thick white walls giving a very clean, crisp feel to them. 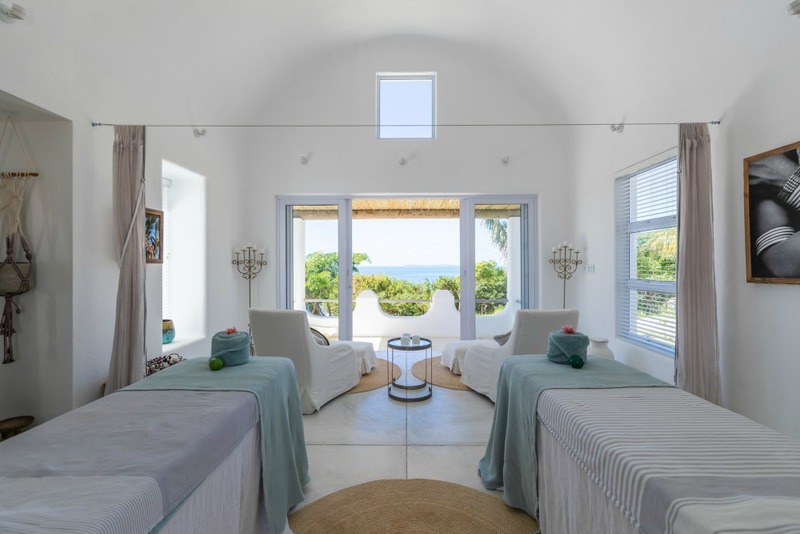 The big, elegantly designed rooms are all named after islands of the Bazaruto archipelago with duck egg blue & soft sage green (the colours of the sea) running throughout their interiors. The huge beds offer views of the sea through floor-to-ceiling windows. Every room has a sea facing balcony with the Bazaruto suite having a stunning, brand new outside bathroom. Villa de Praia is a 3 bedroom villa which opened at the end of 2016. The villa has 3 large bedrooms with en suite bathrooms and two of the bedrooms have outside showers. The third bedroom has iits own entrance and garden terrace. The inside living area consists of an open plan lounge, dining and bar area. The outside living area consists of a large covered patio with bbq, sitting and dining area, rimflow pool with loungers overlooking the archipelago. Villa da Praia comes with its own villa host and a personal chef. The Chapel is a 2 bedroom exclusive-use villa situated a short distance away from the main villa and is perfect for families. The open plan lounge, dining room & bar area comes with its own dedicated villa host and chef. The outside area has a large patio with sitting dining area, outside shower and infinity pool with sun loungers positioned to make the most of the stunning elevated view of the archipelago. MOVIE NIGHT A selection of dvds for guests use at any time. Movie nights include snacks, popcorn and yummy treats. A selection of children’s cooking activities, pool & beach toys, sand art as well as board games, puzzles, assorted toys and other on-site kids activities are available.